Today is a big day for me…I am putting myself through a big test…cannot think of anything to write about…have written about my laundry, my meals, my birthday, my recycling bin, my hair, my lovely daughter, my friends, my karma, my moods, my toilets, wow! Is there anything left to talk about? Well, the universe is always providing. Look around and there is always something to talk about. 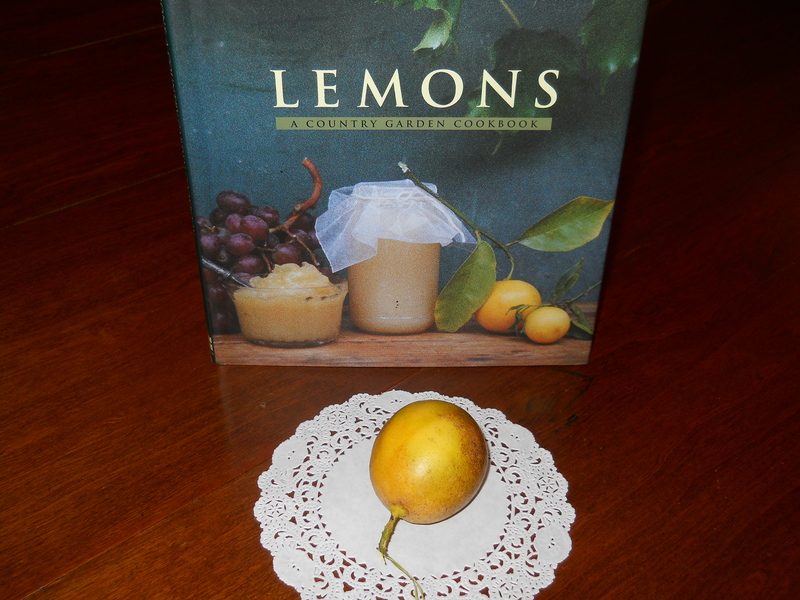 Let’s see…after watching the world’s headlines news, I decided to write about a lemon. This real lemon was in a little basket right around where I pick up my mail. A nice person had picked some lemons from a tree around our gardens and put them there for the taking. I think I am using it on my salad. What kind of lemon do you think is going to be? A good lemon, a bad lemon…one thing for sure, it is a real lemon. I have a lot of pretend fruits and veggies throughout the condo, but real are the bananas, lettuce, carrots, onions, sweet potatoes, and only God knows where these arrived from. Most of them are in the fridge, but my only and unique lemon came from right around the building. Yes!!!! something from Florida…well, now that I think about it, I had an avocado recently and it was from Florida, USA. Buy local…if you can. I also had a very nice surprise today while shopping at the big W box, there was an ornament that I liked, and when I turned the packaging around, guess what! Made in USA. I was so happy I almost kissed the employee in that department. So going back to the lemon, I guess I am delighted in having such a down home fruit. It is going to be useful, Vitamin C, and it will make my salad taste good. I have passed the test! Three hundred fifty-five words. I do not know how you feel about this posting, but silence is golden. Keep that in mind. You can opine if you feel like it, that will be lovely also. So…it was today…25 October, 2011…a day that went to the lemon. This entry was posted in Uncategorized on October 26, 2011 by happycontessa. Lindsay, you have so many hidden talents! You should do something to share all this knowledge you have about almost everything. I am making sure I am using the flavieto. Thanks for such good info. Thanks a bunch, honey bunch! Didn’t you used to have a blog Milagros? Lemon zest can be grated into the body of a dish or you can use a tool that has 3 small different sizes of holes where you can go around and around making thick string of zest. I would form it right into the top of the dough when making cranberry nut bread. Normally I would make it into a bow tie shape. After cooking it was kinda cooked into the surface of the bread. Made it look special even thought it only added a minute or so. Ron loved my cranberry and pina colada breads. He had them hundreds of times. I know, he used to share it with me. More great ideas. Thanks! Ron used to tell me not to tell you I gave him any bread. He would finish it before getting home. Love these stories but I am getting hungry for that bread, lemons in everything including my water. That was good bread. Lindsay really knows his stuff. He even wrote a cookbook. I know you use a lot of lemons. Here there is plenty just outside of my door. By the way, when are coming to the real South, with lots and lots of humidity today. Have a great weekend!